Dubai has already drawn a considerable amount of ire for its supermassive “green” projects that boast a questionable degree of sustainable credibility. Although man-made seawalls can certainly play an important role in preserving coastal ecology, it’s hard for us to justify a swirling archipelago of amoeba-shaped islands as the most efficient way to protect the world’s coastlines. Additionally, the techniques used in the construction of the World Islands have raised concerns over beach erosion, damage to coral reefs, and biodiversity. If we ever harbored the sentiment that Dubai's dubious construction blitz would slow in times of economic unrest, the astronomical scale of the UAE's latest project will surely dispel these qualms. 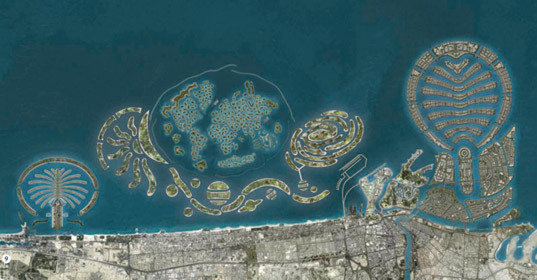 Dubai's largest developer, Nakheel, recently revealed plans for an entire archipelago of universe-themed islands at a $20 million dollar opening party for the Atlantis Resort. The cosmic string of strands will feature a sun, stars, and planets, and will be situated inshore of the already constructed World Islands.